Presentation is important – whether it is a business proposal or a culinary masterpiece. Don’t you think so? And what is one of the most common ingredients used to garnish and present a dish? Yes, it’s cilantro. This wonder herb not only has the power to enhance the flavor and feel of a dish, but it can also benefit your health in various ways. Read on to know more. A member of the Apiaceae or Umbelliferae family, cilantro (Coriandrum sativum) is an herb that is popularly known by its Spanish name. This fab ingredient has different names in different parts of the world – coriander, Chinese parsley, dhaniya, coriandolo, kusthumbari, and so on. Which is a testimony to the fact that it is a global culinary sensation. Cilantro’s origins were traced to southern Europe and the Mediterranean. It is one of the oldest spices in history that has been used for 7000 years (1). There should be some logic behind its use for over 70 centuries, don’t you think? Cilantro is full of nutrients and has a multitude of uses and benefits. Here’s a list of all the favors it does for you and your health. The active compounds in cilantro, like phthalides and terpenoids, induce the production of specific enzymes. These convert the tumor-causing ions and compounds into less toxic forms. This activity stops tumor formation and growth (2). Cilantro has one of the best biochemical profiles amongst herbs that can rejuvenate your body. The terpenoids, polyacetylenes, and carotenoids scavenge the harmful free radicals and reactive oxygen species in the blood. One glass of cilantro crush will flush out all the toxins from your body. Cilantro seeds (also called coriander) possess analgesic activity. They reduce pain by acting on the central pain receptors. Linalool is the active compound that gives cilantro this property (3). 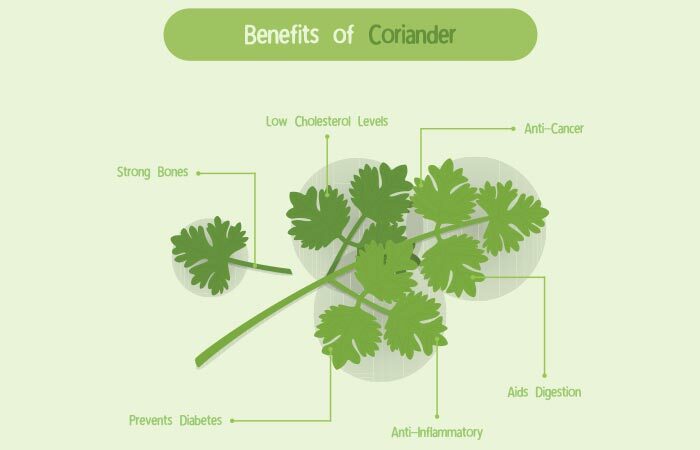 According to traditional scholars, coriander prevents the rising of harmful gases from the stomach to the brain. Modern medicine has found that cilantro and its oil can be used as carminatives (4). According to Ayurveda, coriander seed decoction reduces blood lipid levels. The sterols present in the seeds and leaves inhibit the absorption of dietary cholesterol, thereby preventing weight gain (5). Dealing with UTI gets much easier when you have coriander seeds in your kitchen. These seeds enhance the urine filtration rate of kidneys, leading to quicker urine generation. This reduces water retention in the body. Also, your body gets rid of all the toxins and microbes, keeping the urinary system clean. Cilantro is known for its antioxidant properties. The leaves and coriander seeds contain terpenoids, sterols, polyphenols, aromatic acids, and carotenoids, which scavenge the free radicals and heavy metals and manage oxidative stress in your body. Essential oils or extracts of cilantro can cure bacterial or fungal infections of the skin (including pimples and acne) by purifying your blood. A combination of the antioxidative, anti-inflammatory, and cholesterol-lowering activities of this wonder herb bring about this effect on the brain. The neurons get less exposed to oxidative stress, resulting in a better lifespan, leading to better memory. 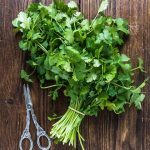 This cognitive effect of cilantro on memory and the nervous system is being applied to manage patients with Alzheimer’s disease. Apart from doing all the good to your body, cilantro and coriander seeds have antibacterial and antifungal properties. Thanks to the bioactive compounds, cilantro can also kill parasites in your body (anthelmintic). This property is exploited not only in medicine but is also applied to food preservation and preventing spoilage (3). That means you can store meat, fish, grain, vegetables, etc. with some coriander seeds or suitable extracts for extended periods. But what gives cilantro these characteristic properties? Let’s find out. Cilantro has high levels of vitamins A and K along with sodium. 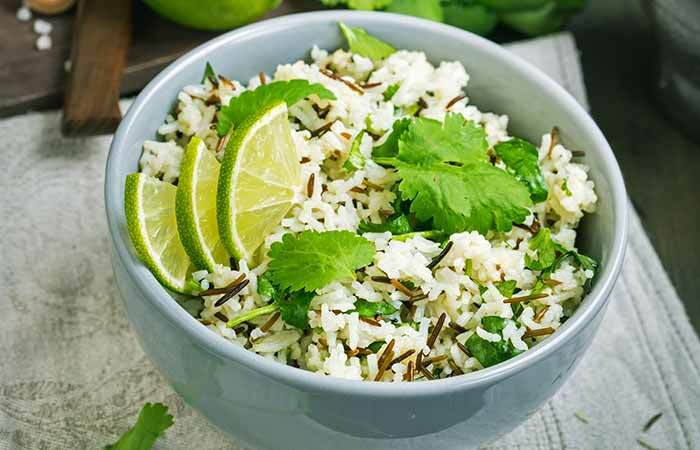 If you need supplementation for folic acid or folate, consider adding more cilantro to your diet in the form of fresh leaves or dried – since cilantro contains folate. I was floored when I read about its importance in ancient medicine and housekeeping. Scroll down for more facts about cilantro leaves and seeds and their benefits. The leaves of the Coriandrum sativum plant are called cilantro, and the seeds are called coriander seeds. The upper leaves of the plant are thin and blade-like, whereas, the lower ones are denser and defined with smaller incisions. Egyptian tombs were found to have coriander seeds in their cases, indicating their medicinal properties. Turkey, Pakistan, and other Middle Eastern countries use cilantro as one of the active ingredients in their herbal formulations. Cilantro has flavonoids that help by relieving menstrual cramps and muscle spasms. Did you know that cilantro has insecticidal properties as well? This is why I love this herb. You can have it in any form and get the maximum benefits – be it a juice, a sauce, a garnish, a dip, in a cooler, or as medicine. Anything that I cook should be quick, tasty, healthy, filling, refreshing, and relatable. Below, I’m going to share a few of my comfort food recipes with cilantro. You are so going to love them! Boil water in a medium saucepan, add salt generously, and cook asparagus for about 15 seconds. Drain and quickly transfer them to a bowl of ice. Drain again and set aside. 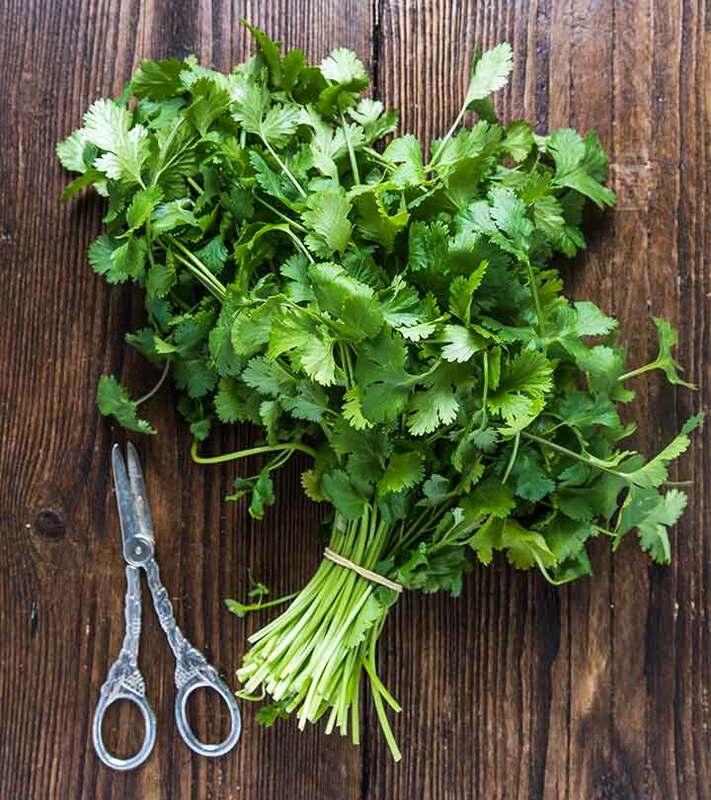 Trim and wash the cilantro leaves and stems thoroughly. Dry them completely. Whisk the soy sauce, salt, sugar, and oil. 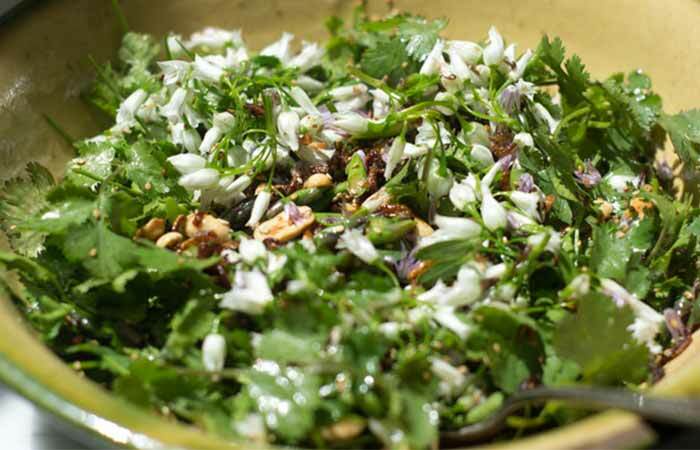 Place the cilantro, peanuts, asparagus, and sesame seeds in a large bowl. Drizzle the soy dressing over the contents and gently (but thoroughly) toss the bowl for a uniform spread. You can add some sautéed cottage cheese cubes if you want a refined texture. Serve with fresh, warm, homemade (garlic) bread on the side. Heat the cooking oil or olive oil in a medium saucepan. Add garlic and sauté until it turns golden brown. Add the raw rice and stir well to coat all of it with oil uniformly. Cook while occasionally stirring until the rice turns brown. Add water, lemon zest, and salt to the rice. Mix well and bring it to a boil. Stir occasionally. Cover the saucepan and leave it on simmer for about 15 minutes. Turn down the heat, mix the contents, and let it sit for 10 minutes. Transfer the rice to a mixing bowl. Add lime juice and chopped cilantro to it. Toss gently to coat the rice uniformly. Place it in a serving bowl and have it with chicken, shrimp, steak, cottage cheese (paneer) or Asian curries. 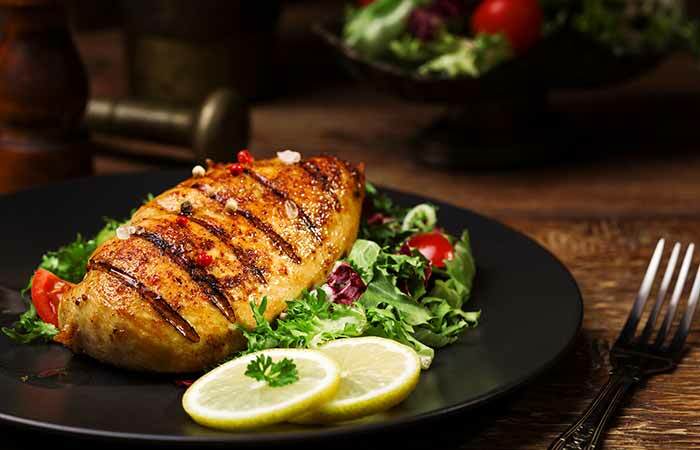 Pound the chicken breasts into half-inch thick pieces and place them in a shallow dish. In a small bowl, mix the lime juice, cilantro, honey, oil, salt, and pepper. Pour over the breast pieces and turn them to coat the mixture evenly. Cover the pieces and chill to marinate for at least 30 minutes. Marinate overnight for best results. Lay them on a grill on medium heat. Turn them occasionally, and cook for 4-6 minutes per side. Do this until the pieces are no longer pink in the center. If you don’t have a grill, cook them on a frying pan with one to two tablespoons of oil over medium heat. Serve them hot with some flavored rice, pita bread or boiled, sautéed veggies on the side. I have made all of these and wished to have more of cilantro in a day. As per the nutrition data, you are allowed to eat about one-fourth cup per day. It has almost zero calories and no fat. So, can you eat 10 g of cilantro a day? Or have the cilantro salad thrice a day? Where and when do you draw the line? And if you overate cilantro, what would happen? Scroll down to know the dark side. Cilantro has chelation effects on the heavy metal ions in your body. The bioactive components interact with mercury, cadmium, tin, and lead and mobilize them – causing their excretion (5). Any implants (dental, splints, or fracture supports) made of these metals will get eroded if you overeat cilantro. Some studies suggest that cilantro and coriander seeds can cause photosensitivity. Your skin becomes very sensitive and almost allergic to sun rays. The exact mechanism of how this works is still not well-studied. 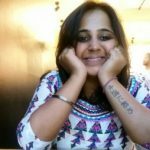 After reading so much about cilantro, all I have to say is, “Get yourself a sapling and grow loads of it in your garden.” You need this herb and the spice in your kitchen for all the above reasons. Try the recipes and write back to us in the comments section below. How is parsley different from cilantro? Parsley and cilantro belong to the same family and look similar. However, when you closely examine, parsley leaves have pointed ends, whereas cilantro leaves have curled ends. In terms of flavor, cilantro is stronger than parsley. Also, the seeds of cilantro, called coriander, are more aromatic and are commonly used in cooking. Parsley seeds have not been used as much. How to store cilantro for a longer time? Fill a small jar or glass partially with water. Place the stem ends in the jar. This way, you can store them at room temperature or in the refrigerator. If you are storing in the refrigerator, cover the leaves of the submerged cilantro with a loose, plastic bag. The leaves will not wilt and stay fresh for about two weeks. Change the water when it gets dirty for better results. In what forms can you eat cilantro? You can add the stems and leaves of cilantro to salads, sides, and main courses as garnish. You can grind cilantro to make pesto and dips and add it to juices or coolers. Dried cilantro and coriander seeds can be used in spice mixes too. Cilantro tincture is used as a part of medical formulations. It is used in combination with other herbs to cure indigestion, respiratory troubles, heavy metal poisoning, bacterial infections, diabetes, and vitamin K deficiency.